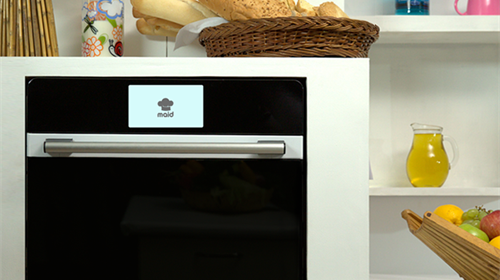 From vinegar and bicarbonate of soda to caustic solutions that burn away oven grease. 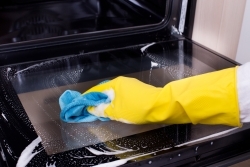 There’s no wonder confusion surrounds which oven cleaning product is better for the job. But the writing’s on the wall, and with a stronger awareness of the impact that we’re having on the world we live in, the drive to become greener, healthier and cleaner is at the top of our agendas. ‘Natural’ no longer means ‘ineffective’. In this blog, we look at some of the key differences between chemical-based oven cleaning products and the more eco-friendly, natural oven cleaning products. 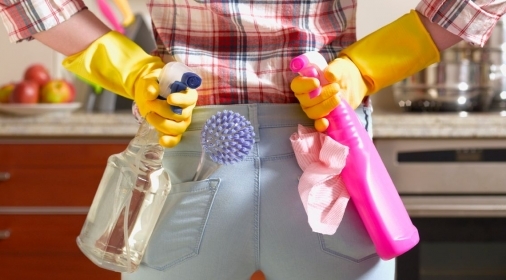 The average cost between the two main types of DIY oven cleaners doesn’t vary too much. Except, if you’re opting for a store cupboard route, like vinegar or bicarbonate of soda, which would be far kinder on your wallet. The average chemical-based DIY oven cleaning product may set you back anywhere between £7-£20. Many natural oven cleaning products place themselves around the £4-£7 mark, bar a few exceptions. Manufacturers are being forced to disclose any harmful ingredients in their products and the reality is that many shop-bought oven cleaning products contain caustic chemicals – chemicals designed to corrode or burn organic material through a chemical reaction. Not a friendly prospect if you consider using this in a place where you ultimately cook the food you eat. But, it goes a step further than that – many ingredients found in this type of oven cleaning product contain non-biodegradable ingredients. This means that once they’ve been rinsed down the drain, they enter the water system, and are eventually flushed into our streams, rivers and oceans. They then enter the food chain – where they’re eaten and absorbed by the food we then eat. Natural oven cleaning products, and those Ovenclean use for professional cleaning are aimed to leave as small a footprint (or none at all) on our environment as possible. Earlier this year we reviewed a list of oven-cleaning products (both chemical-based and natural) and discussed their effectiveness, cost and usability. Traditionally, it has been found that chemical-based oven cleaning products containing caustic soda work more effectively. While that may have been true many years ago, this is no longer the case. True, many of the harsher, chemical-based solutions do work the first time, most times. But, many of the natural oven cleaning products work just as well, without the potentially harmful side-effects. In both cases, there will be products which deliver less effective results and need a longer waiting time or additional scrubbing. 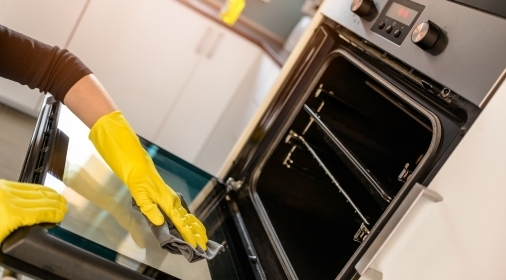 One critical difference between natural oven cleaning products and many of their chemical-based counterparts is the strength of fumes produced during the cleaning process. Fumes that, for many, have left users with sore throats, noses and even asthma attacks or worse. Ovenclean offers professional oven cleaning services without harmful side effects. Our experts use a cleaning system that has been developed by us for many years. The innovative, no added caustic system, means your kitchen is safe, hygienic and free of nasty fumes, whilst being able to achieve fantastic cleaning results every time. If you are looking for a professional oven cleaner, without the harmful side effects that many chemical-based DIY cleaning products bring, call us on 0800 841 7127, or complete our online form for your free quote.